If you're going to be a successful makeup artist, you need to learn how to be on time, EVERY time. Sounds simple, doesn't it? But you would be amazed how many people endanger their MUA careers put on hold because they simply can't show up on time. 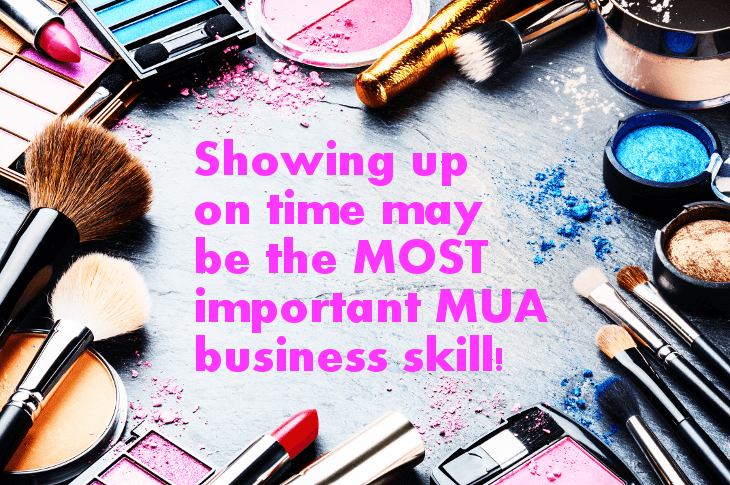 Here's the biggest reason: if you don't show up on time to provide the makeup services that you've been hired to provide, the whole event falls apart. Say you're a bridal MUA. Brides usually have their big day planned out to the minute, and if they're waiting on you to show up, their entire schedule starts to drag. If you're late, that means they're late to get ready, and they're late to the church, and then the groom thinks he's being stood up, and he leaves and marries that trampy bridesmaid that nobody likes. You've ruined a woman's chance at love because you hit snooze a few times. You're doing editorial work on a one-day commercial shoot. The company paying for the commercial has hired an advertising agency, a photographer, a director, three actors, and so on. They've also rented a lot of equipment for use between the hours of 7am and 4pm, and they're paying by the hour. If you show up at 7:30, and everyone has been waiting on you, chances are very strong you're going to get fired, and the director is going to tell eeeeeeeeeeeeeeeeeeeeeeeeveryone he knows that you ruined everything. At any event you work, there is a LOT of money being spent. When people lose a lot of money, they tend to flip out. In a big way. Your reputation is your most important asset, and if you're late, you'll get a reputation as someone who's late, and you won't get work. Her life has been ruined, so she goes on thumbtack.com to leave a scathing review of the MUA. It's a passionate, well-articulated review, and it gets seen by dozens of local brides, who are now certain that the MUA is the worst MUA ever, and nobody hires her. It's kind of unfair, isn't it? You're late ONCE, and people will hold it against you forever? It's not fair, but it happens. Ok, enough of all that. You get it. Be on time. Here are the strategies that will help you be punctual for the rest of your life. You Can Be Early, You Can Be Late, But You Can't Be "On Time"
Here is how most of us try to show up on time: we figure out what time we need to be someplace, then we figure out how long it'll take to get there---say, 15 minutes---and then we leave our house/ apartment/ dorm 15 minutes before we need to arrive. Here's an example: You have to be at work at 9am, and you know it takes 25 minutes to drive there, so you leave your house at 8:35am. Ever notice that this never, ever works? That's because no matter what you do, there will always be something that pops up and makes you late. It could be traffic, it could be a bathroom stop, it could be getting lost for three minutes. It could be absolutely anything, but there's always SOMETHING that gets in the way. If you plan to be on time, you'll usually end up being late. That's why you need to plan to be early. It doesn't need to be SUPER early, but if you can show up at a place 10 to 20 minutes before the start, that's a good thing. And, as a general rule of thumb---the bigger and more important the event, the earlier you want to show up. Waking up in the morning is the cause of a LOT of people's lateness. Ever notice that some people are usually on time, but if you need to meet them before 9am, they're totally unreliable? There's a reason for that: a lot of people are terrible at getting out of bed in the morning. There are a bunch of reasons why people have a hard time getting out of bed in the morning, but the most obvious is a lack of sleep. People always operated their best when they're well-rested, so think of it as career help: when you're getting a good night's sleep, you're forwarding your career. What if you get enough sleep, and you STILL have a hard time rolling out of bed? That probably describes most of us. Here's where you'll need to do a little experimenting. You'll need to find out what works. If you can hit the snooze bar once and get out bed, that's great. If you find that doesn't work for you, maybe you need to force yourself to get out of bed, shuffle to the bathroom sink, and splash some cold water on your face. "Get Enough Sleep" is kind of a tough one, especially because many MUA jobs start so very early (makeup for television and film is notorious for its very early hours). Sometimes you won't get enough sleep, and you'll just have to push through it. It's tough, but you can do it. If you have a hard time getting up in the morning---or even if you don't---it's VERY helpful if you set up the night before. Select your clothes, stock your makeup kit, make sure you have everything you need in purse. When you wake up in the morning, you can simply grab your items and hit the road. It takes a little bit of effort (but not much, really) and it can be a HUGE time saver. Many of us are very optimistic about how long it'll take to get across town, put on our makeup, and get to where we're going. Unfortunately, a lot of times we're wrong! Very often, it takes us a LOT longer to complete tasks than we think. For many people, this is very true of their morning routine. They think it takes 45 minutes to get ready, and it actually takes an hour (or whatever). Here's another thing that will happen when you'll start to figure out how long it takes you to do individual tasks: you'll notice your patterns. You may be late only for events on the far side of town, jobs that require you take a subway, or even for get-togethers with friends. As you really start to notice what makes you late, try to notice some recurring problems. After you've learned how much time it actually takes you to do certain tasks -- and then add a little time onto it for insurance. A good rule is to add 25% to your time estimate. So if you think it'll take you an hour to get something done or to get to someplace, leave an hour and fifteen minutes. This one is super important, and it's an absolute must for makeup artists. When you're working an event, get the itinerary beforehand. Many---not all, but many---of the events that you'll do as a MUA will have a schedule. Brides usually have a print-out of everything they need to do on their wedding days; directors and photographers usually map out an entire shoot, down to the minute; conferences and events have super-detailed itineraries of absolutely everything going on during the show. If you're going to be a part of the event, make sure you have the schedule well in advance. There may be some events that WON'T have a detailed, minute-by-minute schedule. Indie films are sometimes a little more relaxed (although not always! ), jobs at makeup counters are usually more "ebb and flow", and any personal classes you give will be a little more relaxed. You'll still need to get there on time, though. For many of us---for most of us, even---getting places on time is difficult. It takes a little effort. But it's like everything else---the more you practice, the better you'll get at it!